Lithuanian rabbi of the seventeeth century. On hismother's side he was a nephew of R. Moses Rivkes, author of "Be'er ha-Golah." At first rabbi of Lida (whence his name), he became successively rabbi of Zwolin, Mayence, Ostrog, etc. In 1682 he went to Amsterdam, and became rabbi of the Ashkenazic community there. A quarrel broke out between him and the rabbis of the Spanish and Portuguese Jews, who suspected him of being a follower of Shabbethai Ẓebi. 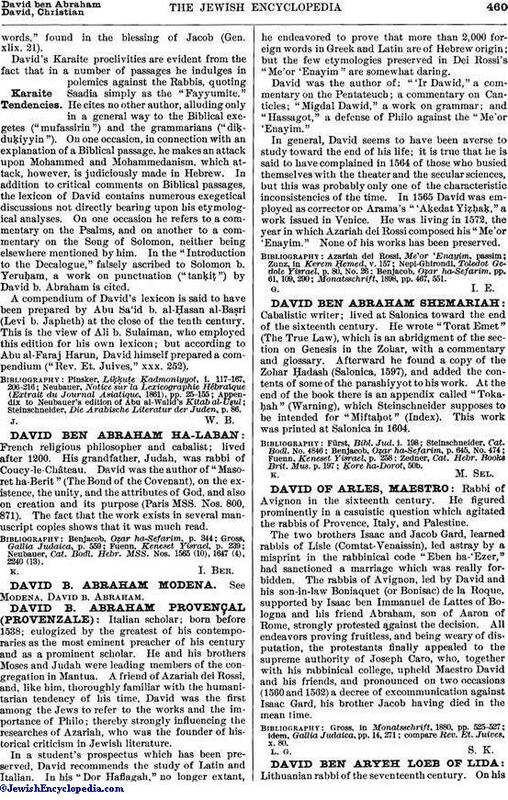 David was obliged to resign his rabbinical office and leave Amsterdam. The Polish rabbis protested and denounced the calumniators. The storm gradually subsided and David returned to Amsterdam. A few years later he went back to Poland, and died in Lemberg. The inscription on his tombstone bears the date 5450 = 1690, but Polak (see "Ḳol Bat Gallim," p. 3) proves this to be a mistake, as several works are extant which were indorsed by him after the year given in the inscription. Stern (see "Bikkurim," i., Preface, p. xxxvi.) gives Ḥeshwan, 5448, which may, however, be a misprint for 5458 = 1698. 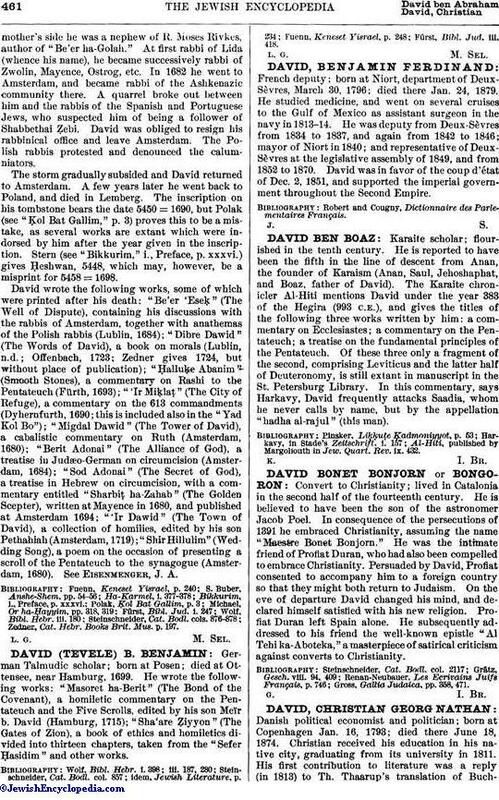 David wrote the following works, some of which were printed after his death: "Be'er 'Eseḳ" (The Well of Dispute), containing his discussions with the rabbis of Amsterdam, together with anathemas of the Polish rabbis (Lublin, 1684); "Dibre Dawid" (The Words of David), a book on morals (Lublin, n.d.; Offenbach, 1723; Zedner gives 1724, but without place of publication); "Ḥalluḳe Abanim" (Smooth Stones), a commentary on Rashi to the Pentateuch (Fürth, 1693); "'Ir Miḳlaṭ" (The City of Refuge), a commentary on the 613 commandments (Dyhernfurth, 1690; this is included also in the "Yad Kol Bo"); "Migdal Dawid" (The Tower of David), a cabalistic commentary on Ruth (Amsterdam, 1680); "Berit Adonai" (The Alliance of God), a treatise in Judæo-German on circumcision (Amsterdam, 1684); "Sod Adonai" (The Secret of God), a treatise in Hebrew on circumcision, with a commentary entitled "Sharbiṭ ha-Zahab" (The Golden Scepter), written at Mayence in 1680, and published at Amsterdam 1694; "Ir Dawid" (The Town of David), a collection of homilies, edited by his son Pethahiah (Amsterdam, 1719); "Shir Hillulim" (Wedding Song), a poem on the occasion of presenting a scroll of the Pentateuch to the synagogue (Amsterdam, 1680). See Eisenmenger, J. A.
Zedner, Cat. Hebr. Books Brit. Mus. p. 197.